It’s set in the Wild West at the time of the Indian Wars (though to think of it as a Western in the traditional sense would be misleading) and, although it draws on historical events and figures, it’s a work of fiction in the main; very much a tale of the tall variety. It’s central character, Jack Crabb (played by Hoffman), recounts his upbringing, both amongst the Cheyenne (who he refers to as ‘the human beings’) and the whites – a publicity poster for the movie described him as ‘either the most neglected hero in history or a liar of insane proportion!’. It’s something of a karmic saga, with lots of wonderful ‘what goes around comes around’ moments, and is both comic and tragic, light-hearted yet full of depth. The film climaxes with The Battle Of The Little Bighorn (aka Custer’s Last Stand) in 1876, an event which had previously been depicted by Hollywood as a valiant fight to the death, with Custer, surrounded by Indians, nobly sacrificing his life for his country. 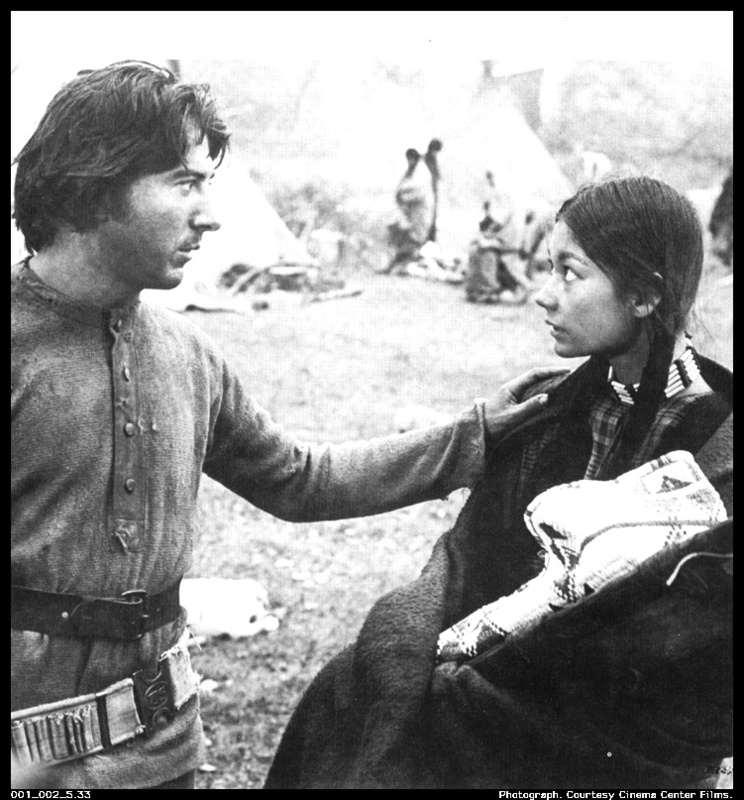 However, his portrayal in ‘Little Big Man’ is hardly gallant, his demise the result of his vanity, whilst his ill-treatment of the Native Americans was also graphically highlighted. His heroic legacy was largely due to his wife, Elizabeth, who published several books celebrating the life and death of her husband, which served to cement his status as an American icon. 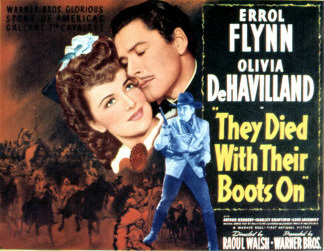 My own knowledge of Custer, up to the point I first saw ‘Little Big Man’, was based on Errol Flynn’s dashing depiction in ‘They Died With Their Boots On’ (1941), where he was given a glorious star spangled death befitting of the carefully constructed image his wife worked so tirelessly to cultivate. 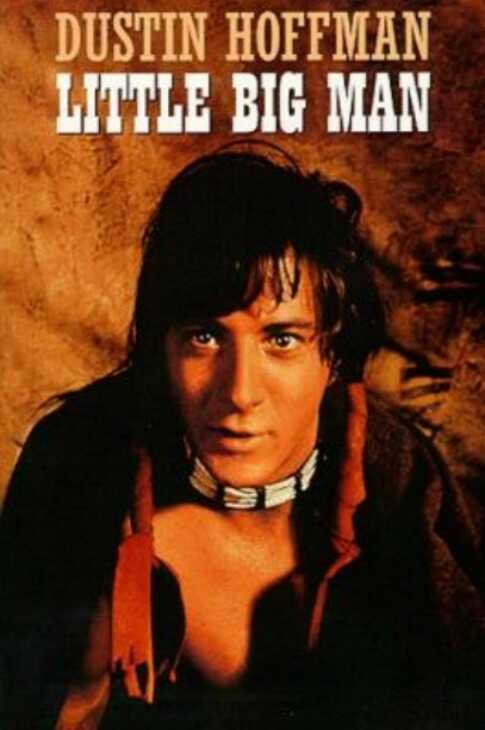 ‘Little Big Man’ sets the record straight, and along with another ‘Revisionist Western’ from the same year of 1970, ‘Soldier Blue’, it not only comments on the genocide of the Native Americans at the hands of the ever advancing United States, but also what was happening over in Vietnam, where a contemporary war was being waged at the time the film was being made. ‘Soldier Blue’ concludes with the infamous Sand Creek Massacre in 1864, when mainly women and children of the Cheyenne (and Arapaho) fell victim to the bloodlust of the cavalry. The parallel with My Lai in 1968, when a unit of the US Army went berserk, slaughtering the unarmed inhabitants of a Vietnamese village, was clear to see. Just over a hundred years apart, these remain two of the most shameful events in US history. The fact that ‘Little Big Man’ manages to deal with such weighty issues whilst sending you away with a smile on your face and a sense of well-being is testament to the unique qualities of this movie. The closest thing to it that I’ve experienced is the wonderful Kurt Vonnegut novel ‘Slaughterhouse Five’, built around the author’s direct experience of the Dresden Firebombing during the latter stages of the Second World War, but presented in a science fiction context (a ridiculous sounding scenario, I know, but an absolutely inspired one) . Needless to say that this is a book that demands a blog post all of its own, so I’ll leave it at there for now. I should give special mention to Chief Dan George (both an actor and an actual Native American chief), who played the wise Cheyenne patriarch Old Lodge Skins in ‘Little Big Man’, and was nominated for Best Supporting Actor in the Academy Awards for his performance in the film. You are spot on about that film, very thought provoking and it made me cry in parts but I still found it enchanting in many ways. Another moving film along the same lines worth seeing is Soldier Blue. Beautifully filmed, wonderful music but incredibly sad.